In 1949, while the world was still licking its war wounds, Laurens van der Post set off for the British colony of Nyasaland (now Malawi) to map two mountains still unknown to cartographers. But his account of the trip is no mere expedition tale. Van der Post’s voice is devoid of machismo, even when one of his party members dies. Instead, his venture to the interior is more existential, and he isn’t afraid to muse in the manner of St. Exupery—a refreshing break from much of today’s vapid extreme outdoor culture. “I have always bought as little and made as few arrangements as possible,” he writes. The book has a resonance beyond its clean, quiet prose—a kind of melancholic self-reflection. Author of many books, farmer, soldier, prisoner of war, and political adviser to British heads of state, educator, humanitarian, philosopher, explorer, and conservationist are titles that barely indicate the depth and breadth of this rare individual. Born in 1906 in the interior of southern Africa, he lived among the people who created the first blueprint for life on earth, becoming the principal chronicler of the Stone Age Kalahari Bushmen. He was also one of C.G. Jung’s closest friends for sixteen years. 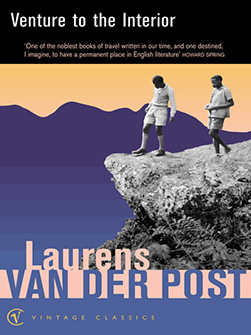 Van der Post dedicated his life to teaching the meaning and value of indigenous cultures in the modern world, a world he felt was in danger of losing its spiritual identity to technology, prejudice, empty values, and a lack of understanding of the interconnectedness of all life on earth. Awarded a knighthood (the C.B.E.) in 1981, Sir Laurens died after his 90th birthday, in December, 1996.